He subsequently served as president of Orincon, overseeing significant sales and market growth until the companys acquisition by Lockheed Martin. He has since served in senior operational and strategic positions with Lockheed Martin, including the development and execution of capture plans for numerous large programs and C4ISR/IT Maritime Strategies and campaigns. Terry holds an MBA from the Naval Postgraduate School, and a BA in Biology from SUNY Brockport. He is active in several professional organizations, including AFCEA, San Diego Military Advisory Council and Tailhook, and community organizations, including Operation Home Front, United Through Reading, Palomar College Foundation and Achievement Rewards for College Students. Terry, could you start off this interview with a company profile? In 2001, Wavestream�s engineers recognized the potential solid state technology had in meeting the growing demand for smaller, lighter, more efficient high power amplifiers to support a broad range of satellite communications systems. We made a significant investment in research and development to create a patented, next generation solid state technology using spatial power combining to address that demand and to provide an alternative to traditional TWTA solutions. The result is an extensive product offering that offers greater efficiency and higher output power in more compact, lighter weight packages. Our company�s first products were well suited to support military satellite communications systems. We developed a solid reputation for producing rugged, high output power amplifiers that could not only perform reliably in extreme environments, but were smaller and lighter to suit a variety of applications, including mobile operations and flyaway terminals. Wavestream has since established itself as a premier provider of Ka- and Ku-band solid state power amplifiers for integration into military satellite communications systems. Our Ka and Ku-band products are field proven under the most extreme conditions, and have a track record for delivering the high output power required with greater efficiency and reliability. We have shipped more than 1,000 Ka-band and over 1,600 Ku-band amplifiers to support a variety of applications worldwide. As we understand the challenges our customers face and have products that consistently exceed industry standards for reliability and efficiency, we�ve experienced significant company growth over the last two years. That growth has enabled us to extend our Ka- and Ku-band product lines to cover a broader range of military and commercial requirements, and has led to the introduction of new products to support C- and X-band systems. We have expanded our international representative and distributor network to offer Wavestream products and support worldwide. We are entering the broadcast market to address the need for more efficient solid state amplifiers to replace aging TWTAs and looking at applications of the technology to other systems. What makes your product offering different? We are able to achieve high output power in more compact, lighter packages through our patented spatial power combing technology. Wavestream�s Spatial Power Advantage technology uses an array of active elements, with each element output feeding a radiating structure. Individual element outputs are spatially combined in a single step, into a coherent output beam. The result is power combining efficiency independent of the number of elements, creating higher output power with greater efficiency, in smaller, lighter package footprints. We�ve leveraged this technology in every Ka-, Ku-, X- and C-band high power amplifier product we produce. The flexibility provided by our technology allows us to be more responsive to changing system requirements and design products that accommodate different power levels, size restrictions or weight limitations. As our products consume less energy, integrators can realize significant energy and maintenance cost savings over their system�s lifecycle. For example, our latest product, the PowerStream 757C-i indoor C-band unit, has been designed as a form, fit, and function replacement for aging, energy-hungry, TWTA amplifiers currently used in the broadcast market. In addition to providing the proven benefits of solid state technology, our new PowerStream 757C-i product offers operators significant costs savings through reduced energy consumption, helping support the broadcast industry�s efforts to �go green�. 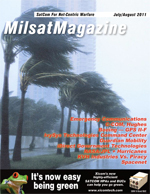 What challenges face the military in regard to MILSATCOM systems? Today�s military faces the challenges of a new mission set, which runs the gamut of traditional warfare to antiterrorism, humanitarian assistance and disaster relief, peace keeping, and nation building. The military must leverage technology resources in new ways to adapt to circumstances that can change instantly and without warning. They are required to interact and communicate with many government and non-government agencies to complete their missions. In this environment, we face the challenge of finding ways to rapidly design, build, launch and support military satellite communications systems that can adapt to constantly changing requirements. Highly reliable communication products must accommodate the vast amount of video, voice and data being generated to support the warfighter and enhance situational awareness across the battle space. Continual command and control connectivity is needed to support all types of operations and strategic and tactical forces anywhere in the world, and under any circumstance. This means creating and supporting communications systems that are tending to be smaller, lighter, more mobile and man-portable or �backpack ready�. The military is also increasingly relying on unmanned platforms for communications and Intelligence, Surveillance and Reconnaissance (ISR) activities. The trend we�re seeing is to off-load reliance on satellites and instead use unmanned systems to communicate real-time information to support military missions. Going forward, understanding the unique challenges of heat, vibration, humidity, weight, size and performance criteria to support communications systems in airborne, water and ground environments is critical. The military�s mission set has also been redefined to support operations beyond the battle space. As we�ve seen with Hurricane Katrina and the Haiti earthquake, the military is called upon to act as first responders to support relief efforts, coordinate humanitarian aid, provide logistical support and establish infrastructure in times of catastrophic disasters. Establishing fast, reliable communications systems and networks is critical in getting relief and aid efforts underway. Again, the challenge is to create satellite communication systems that are adaptable to changing requirements and can be quickly deployed to support instant, reliable communications when established networks are destroyed. How are you positioned for the future to support military SATCOM applications and requirements? Wavestream continues to work closely with our system integrator customers to better understand and define the military�s SATCOM requirements, and anticipate needs going forward. We have established relationships and continue to provide field-proven products for integration into a variety of satellite communications systems developed by companies including General Dynamics, TeleCommunications Systems, Tampa Microwave and Globecomm, to support critical programs such as WIN-T, SNAP and several others. We are well positioned to expand our product and service offerings to meet the military�s evolving mission set to include support for non-warfare missions such as rapid deployment for disaster relief and humanitarian aid worldwide. What are some of your Company�s goals for the next year? We�ll continue to drive toward more flexible solutions with the goal of always remaining responsive to customer and market demands. For our military customers in particular, this means further evaluating the technology to offer products that meet the on-going demand for smaller, lighter, higher power amplifiers that fulfill a broader range of application requirements, including mobile antenna systems, line-of-site and beyond line-of-sight systems, and radar and countermeasures. We also anticipate developing our technology to better address the expanding use of unmanned systems for communications and ISR activities. We will work to make investments in R&D and expand our technology resources to launch additional products and improve efficiency and power performance. We�re launching our first indoor C-band product to support the Broadcast industry and will continue to expand our product offerings to address satellite news gathering, teleport and mobile broadcast communications systems. In addition, we have several new product launches anticipated this year, which will continue to expand our Ka, Ku, C and X-band lines. It�s an exciting time to be with Wavestream as we rapidly expand to meet our customers� needs and to support the end user, the war fighter.